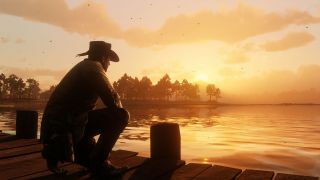 If you've played any other Rockstar games in recent years, it will come as no surprise that the Red Dead Redemption 2 map is huge. Encompassing a big chunk of the West, it sweeps from the snowy starting point of Ambarino, down to the lively port town of Saint-Denis, and that's before taking into account the expanse of New Austin familiar from the original Red Dead Redemption - this is not something you'll be able to completely observe in a single day. With so many areas off the beaten path and hidden secrets to find, you'll be discovering new locations long after you've completed the main story. The map does also contain and entire area that is brimming with Red Dead Redemption 2 spoilers, but if you aren't concerned about that then do carry on. SERIOUSLY, LAST CHANCE. AVERT YOUR EYES. So there you have it. the full Red Dead Redemption 2 map, complete with a ton of locale spoilers, so sorry if your little eyes are now all sad because you know where you're eventually going to be headed in the game. We did warn you.